Up to 1920, the Bell System had established a standard of manual service throughout the country. They felt that operators could provide a more personal service to their customers and that customers did not want dial service. Meanwhile, independent telephone companies had been replacing their manual switchboards with dial service and had experienced very positive results. Outside of The Bell System, a switching system known as The Strowger System had been developed in the late 1800s. The patent was owned by The Automatic Electric Company, which was formed in 1901. Through aggressive competition throughout the country, a Bell company would occasionally buy out an existing independent company that had installed Strowger equipment. In some places, Bell actually removed the dial equipment and converted the customers back to manual service. 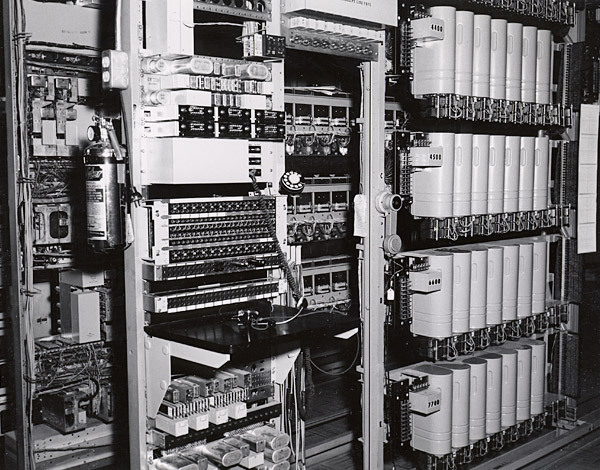 The Bell System engineers eventually reconsidered the idea of automated switching and studied the Strowger system, which was also known as "Step-by-Step". They saw the merits of this system for smaller towns and communities but found it to be unsuitable for big cities. In 1916, Bell licensed the Strowger design from Automatic Electric and was able to manufacture the equipment. For big cities, Bell decided to pursue their own design. In 1921, Bell Telephone introduced the Panel Switching System. This system was developed by Bell Laboratories to satisfy the requirement for a dial system for larger cities. The machine used motor-driven selector rods and contact banks. For its day, it was quite a technical marvel. Following a successful trial in Omaha, Panel machines began to be installed in cities all over North America. The cost of a new building, the Panel machine, supporting equipment and upgrades to the other Atlanta offices was over $2 million. Adjusted for inflation, that would be about $9 million in 2000. A switchman working on a Panel switching machine. In 1921, Southern Bell began construction of a new building, adjacent to the Ivy Office at 25 Auburn Avenue. The new building was referred to as the Ivy-Walnut building. The building construction and subsequent installation of Panel switching equipment took 20 months with an average of 200 men on the job, continuously. Preparations for dial service involved more than just the installation of the new building and equipment. The public had to be "trained" to add leading zeros to telephone numbers within all offices. A number like Main 268 needed to be written as Main 0268. This was officially put into effect with a new telephone directory that took effect on August 20, 1922. At midnight on August 19, 1922, corresponding with the new directory, about 4000 customers in the Ivy office had their telephone numbers changed to Walnut. There was no dial service yet and no actual new manual equipment. The Walnut numbers continued to be worked by the Ivy switchboard. Ivy "A Board" operators could identify which customers on the Ivy board were Walnut customers by green caps placed over the answer lamps. "B Board" operators identified them by a semi-circle painted onto to the line jacks. This "theoretical" Walnut office was put into service in advance of dial service so that traffic studies could be made to determine the outgoing and incoming traffic to the new office. For the next several days, operators completed calls for customers where the leading zeros were not given or in the case of Walnut customers being given as Ivy. In these cases, the operator gave the customer the correct information and put the call through. After a period of time, the operators stopped doing this and sent these calls to an intercept operator for handling as "no such number". Before dial service could be established, many new trunk cables were installed between existing offices and all of the Atlanta manual offices were modified. At the "A" operator positions, the Key Indicator system was installed. At the "B" operator positions the Call indicator system was installed. This was the case for the larger manual offices with the No. 1 Type Common battery switchboards. The East Point and West (Franklin) offices were smaller No. 9 Type manual offices. The smaller offices did not receive Key Indicator or Call Indicator equipment. Their "A" operators received dials for placing calls into Walnut. All operators in the manual offices had to be trained on the new equipment. Dial Service Begins for "Walnut"
At midnight on July 28, 1923, the new machine entered service. All of the Walnut customers were cut over from the Ivy switchboard. The first dial phones were candlestick phones. To place a call, you lifted the receiver, waited for dial tone, then dialed. The dial tone was a much lower pitched tone than what we hear today. If the switching equipment was busy, dial tone might take several seconds to come on. Customers were not used to dial tones and operating the dial. Some people forgot to wait for the tone and dialed too soon or didn't dial properly. This resulted in wrong numbers or calls that did not go through. This was especially true in the first couple of days of the new dial service. When the call did not go through, an operator would be connected to assist the customer. There were no recorded announcements at this time. A cartoon appeared in the newspaper poking fun at the confusion caused by people learning how to use the new dial service. Over the next several years, many downtown businesses had their numbers changed to Walnut numbers in order to take advantage of dial service. The numbering plan chosen for Atlanta was the 6 digit system of two letters and 4 numbers. Using this system, you dialed the first two letters of the office name followed by the 4 digit number within the office. When office names were printed in telephone directories and on telephone dials, the first two letters were always capitalized. This was done to emphasize that you dialed only those two letters. An example might be WAlnut 3612, for which you would dial W A 3 6 1 2. With office names like Ivy, Walnut and Hemlock, it looked like offices were going to be named after trees. But this practice didn't continue. As a part of the implementation of dial service, the Decatur, West, and East Point offices were given new names too. Decatur became "Dearborn", West became "Raymond", and East Point became "Fairfax". Manual and dial offices coexisted for almost thirty years. So procedures for handling calls between them had to be developed. From the beginning, it was determined that customers should not have to worry about with which offices had dial service and which had manual service. If you were a dial service customer, you dialed all of your calls. If you were served by a manual office, you gave the operator the number you wanted and she put the call through. If you were on the Walnut office and dialed another Walnut customer, the Panel equipment completed the call automatically. If you dialed a number in one of the manual offices, such as Hemlock, the automatic equipment connected the call to a trunk to the Hemlock office. The Walnut office Panel equipment sent forward the last 4 digits of the number you dialed and sometimes a party letter. The number was displayed on a Call Indicator on the Hemlock "B" operator's board and she plugged the trunk cord into the jack associated with the called party's number. The number rang automatically and you heard a ringback tone, the same as if you had dialed a customer on the Walnut or other dial office. If the number was busy, the switchboard equipment sent back the usual busy signal. Party line letters were still used in the manual offices. For HEmlock 2345-J, you would dial H E 2 3 4 5 J. This meant that private numbers were six digits long and party line numbers in manual offices required a seventh pull of the dial. So, when calling a manual office, the dial equipment always had to wait for a few seconds after the sixth digit in case you dialed a seventh digit. If you were a customer on a manual office and wanted to call a customer in the Walnut office, you gave your "A" operator the number, as usual. The "A" operator plugged into a trunk going to the Walnut office and input the last 4 digits of the number into the Key Indicator on her switchboard. The term used was "writing up the number". The switchboard equipment sent the number to the Panel equipment at Walnut and the number rang. East Point and West office operators did not have Key Indicators and used dials on their switchboards to dial calls into the Walnut office but the experience for the customer was the same. 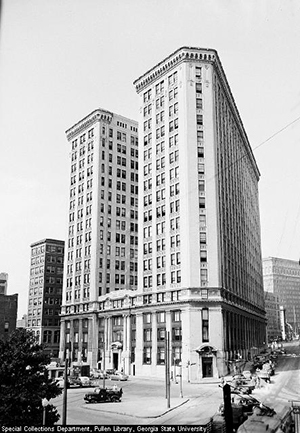 In 1924, Southern Bell moved the company headquarters to the Hurt Building. The Hurt Building was an office building built in 1914. The building contained multiple tenants. Southern Bell leased an increasing amount of space in the building over the next several decades. 1928 The City's Second Dial Office, "Main"
In 1928, a second Panel Switching Machine was installed in the Auburn Avenue building and the Main office became the second office in town to be converted to dial service. The Main office was a manual office in the South Pryor building up to this time. At this point, most Downtown customers had dial service while the rest of the city did not. The remaining Downtown manual office, Ivy, probably served mostly residential customers and party lines. When the Main office manual switchboard was taken out of service, the Atlanta Toll switchboard would have been the only thing left in the South Pryor Street building for another year. The building was then sold to Fulton County to be used for additional government offices. In 1929, the new 51 Ivy Street building was opened. This was an Art Deco style building similar to others built during this period in New York and Chicago. The building was planned to be 21 floors but was originally built to only 6. It was later expanded to 14 floors as in the photo. Southern Bell and AT&T occupied it jointly. The building became well known as "51 Ivy". The new building housed a new, larger Atlanta Toll Switchboard, replacing the switchboard in the South Pryor building. Atlanta was becoming a major center for long distance traffic in the Southeast. Long Distance Operators in Atlanta in 1929 had a limited number of circuits available to other cities. To Birmingham and Macon, there were 15 circuits. To New York, there were 7. To Chicago, Cincinnati, and Miami, there were 5 circuits each. For Detroit, St. Louis, and Dallas, there was a single circuit. There were essentially two types of long distance calls during this time period: Short Haul, and Long Haul. Calls within about 30 miles were considered Short Haul. These calls could generally be handled by the "A" Operator in your central office. If you were served by a manual office, you would simply ask for the town name and number, just like with a local call. If you had dial service, you would dial "0" for your local "A" Operator for these types of calls. Long-Haul calls were handled through the Long Distance Operators in the 51 Ivy Building. Throughout the Bell System, procedures for handing these calls were quite elaborate. The system in use in 1929 was referred to as the "Callback System", which meant that you would be called back when your call was ready. This system involved many steps and 5 or more operators per call. 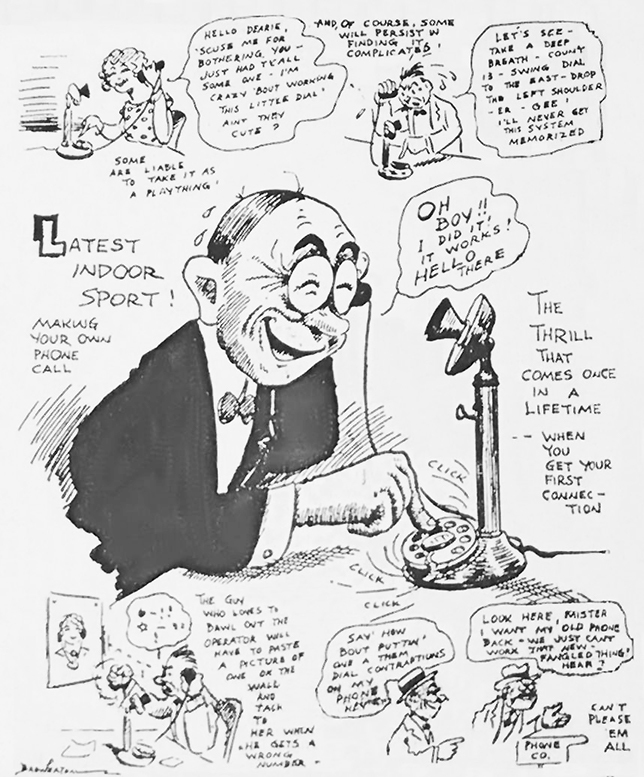 To initiate a Long Distance call, if you were served by a manual office, such as Hemlock, you picked up your telephone and asked for Long Distance. If you had dial service, you dialed "110". Either way, you reached the long distance switchboard. The first Long Distance operator you talked to was called the Recording Operator. She would record the details of your call on a ticket. In many cases you would not have known the telephone number of the person you were calling, only the City and the name of the person or business that you wanted. After taking down this information, the Recording Operator would ask you to hang up and wait to be called back. In some places, a young lady on roller skates picked up the tickets from the Recording Operators and delivered them to other operators for handling. This could have been the case in Atlanta. Regardless, the ticket would next go to a Directory Operator, who had telephone directories for most major cities. She looked up the telephone number of the party you were calling and wrote it on the ticket. The next stop was the Routing Operator, who looked up the route to the destination city. A call to Buffalo, for example, would have been routed through New York City. The ticket with the routing information was then passed on to the Outward Operator. The Outward Operator, also known as a Line Operator, placed the actual call to the distant city. The Outward operator had access to trunks going to the first city required according to the routing on the ticket. If all trunks were busy, the Outward Operator would hold on to the ticket until a trunk became available. The operator would then ring the operator in that city. If the destination city required routing through intermediate points, the Outward Operator asked to be connected to each of the cities shown on the ticket until the desired city was reached. The operator answering the call in another city was called the Inward Operator. The Inward Operator had access to trunks going to the central offices in that city. 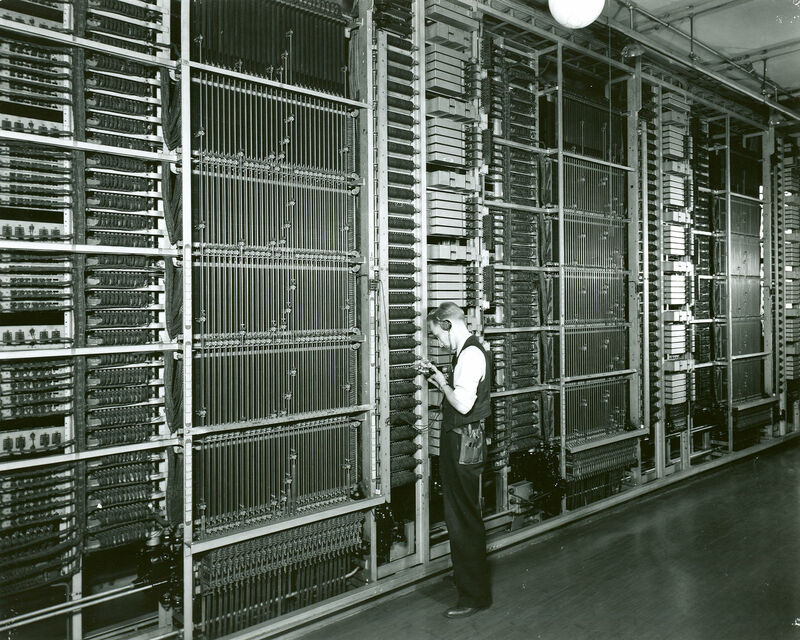 Using one of these trunks, the Inward Operator would connect to "B" Operator in the called party's central office and ask for the number. The Inward Operator stayed on the line to insure that the called party could be reached. If the party was not available, she could ask where they might be reached and ring another number in the same office or in another office. Once the called party was finally on the line, the Atlanta Outward Operator would connect back to your central office and ring you back. This elaborate process was necessary because there were so few trunks available between cities. This system allowed tickets to be queued up, waiting for trunks to become available. This used the limited trunks efficiently. Over the years, as more and more circuits became available when technology improved, the Callback system was used less and less until it was finally eliminated in favor of the "straightforward" system. The Straightforward system allowed a call to be set up over the network from operator to operator while you waited. This system was also sometimes known as the CLR (Combined Line and Recording) system since the Recording Operator and Line Operator functions were combined. The "Ivy" Office Renamed "Jackson"
With the issuance of the telephone directory on November 20th, 1929, the name "Ivy" was replaced with "Jackson". The newspaper reported that Southern Bell needed to make the change because the digits dialed for Ivy ("48") would conflict with other growth plans. The newspaper also reported that the office name "Huntley" was also dropped and those customers moved to "Jackson". No historical information has been found on the Huntley office. It is interesting that the letters "HU", for Huntley, would also be dialed as "48". So it would be impossible to have both Ivy and Huntley dial offices. Moving both of these names to "Jackson" would not have cleared up any conflict between them either. So the existence of a Huntley office remains a mystery. A more plausible explanation for renaming Ivy is the fact that, with the introduction of dial service, the letter "I" looks like the numeral "1" and many people could have confused the two and tried to dial "1" on the dial when calling an Ivy number, instead of dialing "4". As more dial service was introduced into the city, this would have become more and more of an issue. So avoiding the letter "I" and the letter "O" in office names would have made sense. The Step-by-Step system, also known as the Strowger system was invented in the 1890s. Up until 1919, the Automatic Electric Company held the patent on it. In 1916, The Bell System had signed a license agreement to allow them to manufacture it. Bell purchased some of the equipment directly from Automatic Electric until they started to produce it in 1926. Bell had decided in 1920 at that Step-by-Step was a good system for small towns and communities but not suited to the complex local calling areas of big cities. For that purpose, they had invented the Panel system. It is surprising that Southern Bell decided to switch to using Step-by-Step in Atlanta instead of continuing to build Panel offices. We believe this was the only city in North America where Step-by-Step was used along with Panel. The Panel system was not designed to communicate with Step-by-Step and used a completely different signaling system. So some type of custom interface would have been required. In addition to compatibility issues with Panel offices, Southern Bell had invested a large amount in 1923 on equipment in manual offices to enable them to interwork with the Walnut Panel office and then the Main Panel office. This equipment would have been used for other Panel offices as they were introduced into the local area. This equipment was not compatible with Step-by-Step. So all new facilities had to be built into the manual offices to work with Step-by-Step offices. One theory for the reason for this change had to do with a possible crisis of manufacturing, brought on by the crash of the stock market in 1929 and the start of the Great Depression. It is possible that Southern Bell had built new central office buildings in anticipation for Panel equipment and was suddenly unable to obtain it. Since Step-by-Step was popular outside of big cities, it might have been more readily available. Step-by-Step gets its name from the way that it switches calls; one step at a time. Each digit is dialed into a selector. The selector connects the call to the next selector in sequence until the called number is reached. This is different from the Panel system, which stores up the dialed number until it can decode the first 2 or 3 digits to determine where the call needs to go. In 1931, four new dial offices, Cherokee, Raymond, Vernon, and Calhoun were opened. These all used the Step-by-Step switching system. The Cherokee office served the Buckhead area. It was located in a new building at the corner of Peachtree and Roswell Roads. Customers in the area would have been cut over from the Hemlock office. The second new Step-by-Step machine in 1931 was installed in a new building on Gordon Street (Now Ralph David Abernathy Blvd). This machine replaced the Raymond manual office, keeping the name Raymond. Following an addition to the Crescent Avenue building, which housed the Hemlock office, the third new machine was installed there. The Vernon dial office provided service for new customers in the same area as Hemlock. The Hemlock manual office remained in service. The fourth new machine installed in 1931 replaced the manual office in East Point. This office, called Calhoun, replaced the Fairfax office. All customers were switched at the same time. 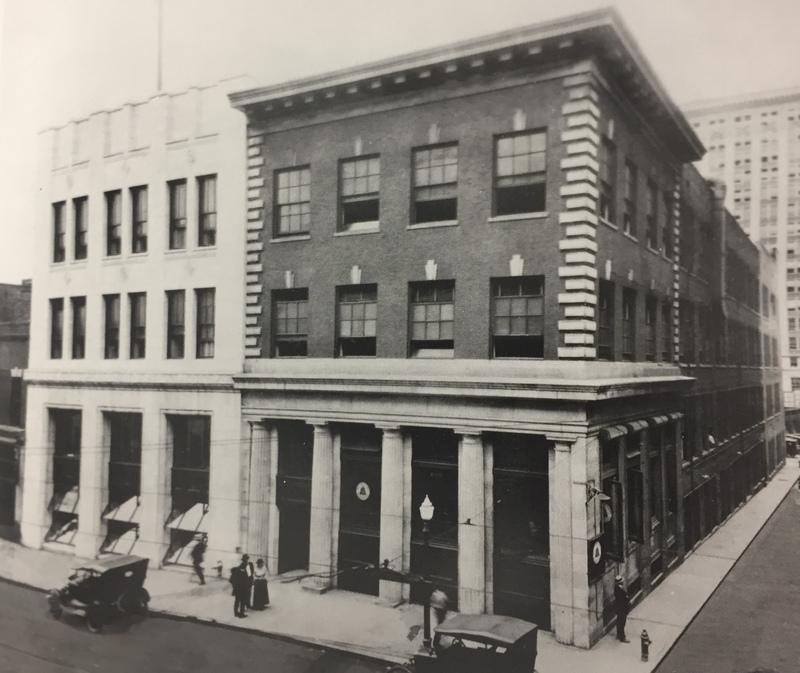 In 1934, a new dial office called Cypress was opened in the Auburn Avenue building along with the Walnut, Main, and Jackson offices. This meant that the Auburn Avenue building now had three different switching technologies: Manual, Panel, and Step-by-Step. 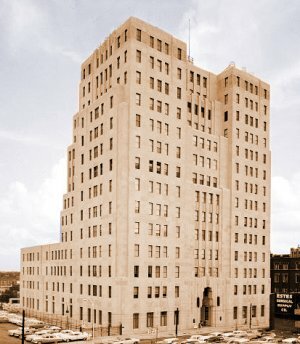 In 1937, the Dearborn Office in Decatur was converted from manual to dial service. Sometime between 1933 and 1944, a second dial office called Atwood was added to the Crescent Avenue Office and a second dial office called "CRescent" was added to the Decatur central office. Strangely, the name Crescent was the name of the street where the Hemlock central office was located but it had nothing to do with that office. When manual offices were converted to dial service, customers with private lines usually kept the same number. Party line customers always had to be assigned new numbers because party line letters were not used in the dial office and each party had to have a different number. By 1940, the majority of the city was served by dial offices. Remaining manual offices were Jackson, Hemlock, and Belmont. These offices remained manual for ten more years. World War II brought a noticeable slowdown to new construction during the 1940s. But some progress did occur in the later part of the decade. 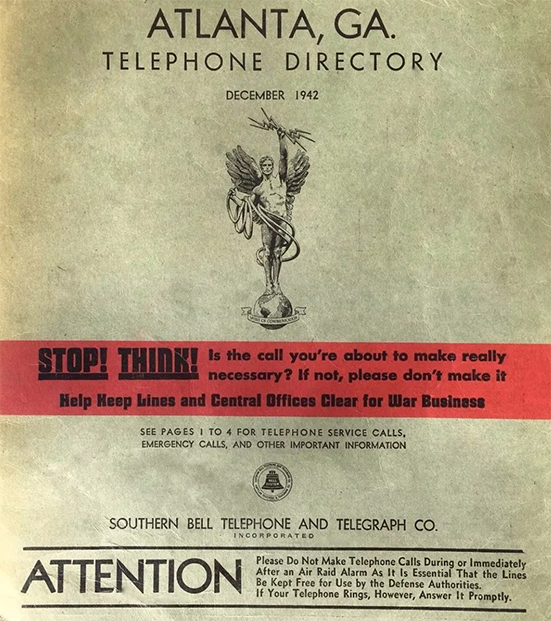 During The War, The Telephone Company placed ads in magazines and newspapers requesting that people limit their Long Distance calls to five minutes. In 1946, the Jackson manual office was split into two offices. The new Lamar dial office was opened in the Auburn Avenue building and took over all of the private line customers on the Jackson office. These customers kept the same last 4 digits in the Lamar office. Most people may not have noticed. But since Lamar (LA) and Jackson (JA) both correspond to "52" on the dial, customers in dial offices could have continued to dial the name Jackson. So the reason for the name change is unclear. The old Jackson manual office retained the party line customers and was renamed Alpine. These customers got to keep their existing last 4 digits and party line letters in the Alpine office. Then in 1949, the Alpine office was converted to dial service keeping the same office name but all of the Alpine subscribers got new numbers. The Belmont office was converted to dial service in 1947. It appears that private line customers' numbers did not change. Party line customers would have had their last 4 digits changed. The conversion of Belmont left Hemlock as the only remaining manual office in the city. In 1949, the EMerson office was added to the Crescent Avenue building in Midtown. This was the third office name in this building. The VErnon and HEmlock offices remained. The same year, the EVergreen office was added to the Decatur central office building, accompanying DEarborn and CRescent. Also this year, the new DIxie office opened in a new building at Lakewood on the southeast side of town. This office was originally supposed to be called FIlmore. But local residents objected because Filmore was the name of a Yankee officer during the Civil War. So the name was changed to DIxie. Since both FIlmore and DIxie translated to "34" on the dial, this did not require any equipment changes. Starting in 1947, a major expansion was started on the 51 Ivy Building to raise it from its initial 6 floors to 14 floors. This expansion was completed in 1949. On October 9, Southern Bell conducted an open house to show off the new facility to the press and the public. The 7th floor of the enlarged building initially contained a large number of additional Long Distance operator positions. During this period, small offices existed in many communities and towns outside of Atlanta. Some were still manual and some were dial offices. Towns like Marietta and Smyrna were manual until about 1950 when they were converted to dial service. Smaller communities, like Woodstock had dial service earlier than that. It was decided early on that it was inefficient to hire switchboard operators for very low traffic offices in small communities. So small Step-by-Step machines were installed in these places and referred to as Community Dial Offices or "CDOs". The CDOs usually had 4-digit dialing within the community only. All other calls were Long Distance and were placed through an operator working in a nearby town. In the case of Woodstock, for example, operators in Marietta provided this service. The equipment installed in Community Dial Offices was generally No. 355A Step-by-Step. This differed slightly from the Step-by-Step equipment that was installed in larger offices in Atlanta and towns like Marietta. The larger offices were known as No. 1 Step-by-Step. The two versions had different sized racks and different power plants. The dial tones, busy signals and ringback tones sounded very different. On December 3, 1950, the first Extended Area Service became available. You could now dial Clarkston and Chamblee as local calls. To place a call to Clarkston or Chamblee, you dialed "21" plus the 4 digit Clarkston or Chamblee number. At this time, the Chamblee office area included Dunwoody and the Clarkston office area included Tucker. Prior to this, all these areas were Long Distance. Other places, like Smyrna and Marietta were still long distance in 1950. 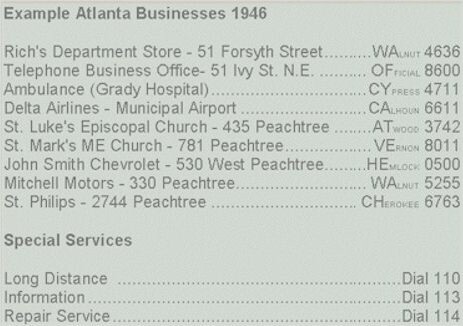 In June of 1951, the Hemlock office was removed from service, bringing the era of manual service in Atlanta to an end. There were several articles in the newspaper about the operators' jobs coming to an end. All of the operators were given new jobs in other locations. Many became Long Distance Operators in the 51 Ivy building. You might think people were nostalgic about giving up the last manual service. Some people did prefer to talk to a human being instead of dialing into a machine. But in general, subscribers felt a sense of relief to be rid of the old service. During busy periods, operators were slow to answer. Operators also made occasional mistakes, connecting customers to wrong numbers. For several years, some of the customers served by the Hemlock office had been requesting to have their numbers changed in order to have dial service. But as a general rule, Southern Bell would not do this. When Hemlock was finally retired, customers were given new numbers on a new dial office called Elgin. Outside of Atlanta, manual offices remained for a few more years. Some Georgia towns may have had manual service as late as 1960.